The Relief Reusable Hot and Cold Pack (Pack of 10) has been designed to help soothe muscular discomfort and help to reduce swelling and bruising. Simple to get hot or cold, it can provide relief for a short period of time for lesions such as minor scrapes and bruises, muscle aches, headache, minor burns and insect bites. The Reusable Hot and Cold Pack is ideal for both cold and heat therapy to treat a variety of maladies, as the gel inside the pack is able to absorb and retain temperatures across the spectrum. It is a versatile product often used during sports and in gyms for its myriad of healing properties. This bundle of 10 Hot and Cold Packs are ideal for any sports team, with its reusable properties ensuring that won't run out in a hurry. To use as a hot pack, put it in the microwave for approximately 30 seconds, or alternatively you can immerse it in boiling water for four to ten minutes. The hot pack will assist in increasing circulation, providing temporary relief to muscle aches, back pain, sinusitis or menstrual cramps. To activate it as a cold pack, you must store it in the freezer for at lease one hour. The cold pack will assist in temporarily reducing swelling, toothache, headache and fever. 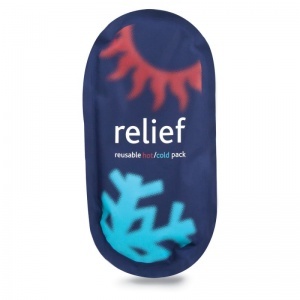 The Relief Reusable Hot and Cold Pack (Box of 10) is usually dispatched via First Class Royal Mail and delivery should be within 1 to 3 working days.